Offer low-cost, high-value massage for holiday gifts. Help my clients with their holiday gift shopping. Allow more people to experience my work. Give my income a boost. Attract new clients into my business. And here’s what I created – The Stocking Stuffer Special! Once I figured out the Stocking Stuffer strategy, I needed a system to sell the gift coupons, so as not to annoy people or make myself hoarse by repeating the same offer with every client every day. So over Thanksgiving weekend, I set up a Gift Station in my clinic – a holiday theme table with a display of beautiful Gift Coupons, colored pens and postage stamps. I even offer to mail or email the Gift Coupons for them! (Bonus for me: I will acquire more names for my email list, to send an invitation to subscribe to my newsletter!) Clients appreciate this mailing service, which doesn’t cost me much time and adds more value to their experience with my practice! How will you set up your holiday gift coupon area? To kick off the Stocking Stuffer Special, in mid-November I post signs around the office and send an email, to let people know that it’s… COMING SOON! Then, the day after Thanksgiving, I send clients an email announcement and reminder to bring their address book/contact list to their next appointment. When they come in and purchase their package of gift coupons, they can sit right down and address the envelopes, enclose the coupons and stick the stamps. Then I offer to mail it for them. People love this and look forward to it each holiday! PS – I don’t charge for postage. The extra income and opportunity to acquire new clients is worth the cost of stamps! I continue with emails throughout the holiday season, 3 per week from Thanksgiving through New Years. (Remember – it takes 7 exposures for people to respond to marketing!) I remove clients’ names as they buy, so as not to pester them after they have made a purchase. I also display Gift Coupon signs in every room of my clinic, including the restroom – in clear view of the toilet! My clients really appreciate this one-stop shopping experience and most of them buy extras to keep on hand for future gift occasions. Winter holidays present the year’s best opportunity to sell Gift Coupons! Many people have a long gift list and appreciate an affordable way to treat their family, friends and colleagues to the gift of health! You can help them with this by offering packages of gift coupons for their holiday shopping convenience. 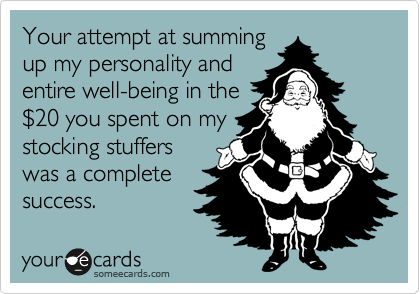 The Stocking Stuffer Special is an amazingly effective holiday sales strategy for wellness practitioners! It could make the holidays your most profitable time of year! This entry was posted in Uncategorized by The Prosperous Practice.Bookmark the permalink.